Many Muslim scientists like Ibn Sina (Avicenna), al-Hasan ibn al-Haytham, known in the West as Alhazen, and Muḥammad ibn Musa al-Khwarizmi (Algorithmi), made great contributions that shaped the modern world. 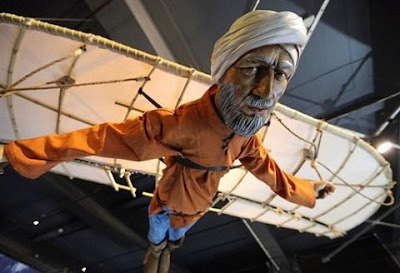 In the 9th century, Muslim inventor Abbas ibn Firnas was the first to design and test a flying machine, hundreds of years before da Vinci drew plans of his own. Hospitals as we know them today believed to have come from 9th century Egypt. A replica of the first person said to have flown with wings is displayed at the science museum in central London on January 21, 2010. The debt owed by European scholars to their Muslim counterparts on everything from water pumps and blood circulation to engineering and map-making was unveiled in a London exhibition on January 21. Coffee, computers and piston engines - could we imagine a world without them? These are intricate parts of every day life for most of us and the knowledge that led to them was either invented by or passed down through the ancient Muslim world. That is the theme of an exhibit in London's Science Museum and it's a far cry from the view held by some that the Muslim and Western World represent a "clash of civilizations." A simple cup of coffee has become an intricate part of so many cultures. It's called "Kawha"- where it was first developed as a drink - in the Arabian Peninsula, in today's Yemen. Professor Salim al-Hassani of the University of Manchester explains the coffee beans were actually brought to Yemen from the Horn of Africa, from Ethiopia. "Well of course, coffee was invented in the very early years of Islam - a guy called Khaled in Ethiopia, a young man looking after his sheep," al-Hassani said. The sheep seemed to like the beans. So the young man took the beans to Yemen - the story goes - and the drink was developed and spread like wildfire. And there were many other inventions or innovations passed on by the early Muslim world from the 7th Century onward, says Hassani. "One of them is the invention of the university. 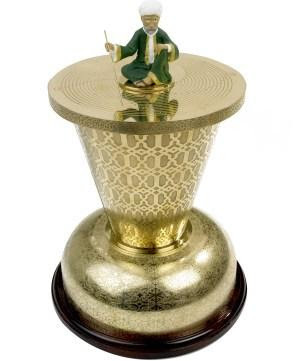 This was done in the year 850 by a young lady called Fatima al-Fihri in the city of Fez in Morocco," al-Hassani said. "The first university as we know it in the world, giving degrees and so on." And that's the theme of this exhibit at the London Science Museum. It's called 1001 inventions: the Muslim Heritage, a bit like "1001 Arabian Nights," the well known fairy tale. The exhibit in London focuses on scientific or technological inventions and advances that changed our world - from some of the earliest universities, to innovations in medicine, hygiene, pumps, and water wheels. Some says these important achievements have been forgotten amid the news often coming out of the Muslim world today that focuses so much on strife and terrorism. But, ask just about anyone on the streets of, say, Cairo or Damascus today and they haven't forgotten - they'll readily tell you about Islam's glory days - not just its conquests but its cultural, scientific and technological innovations." These advances came at the height of the Islamic empire's glory when it spread from the Middle East, across North Africa to southern Spain and beyond. A time when Muslim scholars and inventors were at the forefront, says Hassani. "During that time, there were enormous contributions in science and technology that we have forgotten about and that comes to us from other civilizations," al-Hassani said. "And, it came to use over a very important civilization and that is the Muslim civilization." Muslims absorbed knowledge - from India, China, the Greeks, the ancient Egyptians - and passed it on. One exhibit exemplifies that mixture - a giant clock featuring an Indian elephant and Chinese dragons and using ancient Greek water works. The one here is a replica of the original designed by the Muslim inventor, mathematician and engineer al-Jazari in the early 13th Century. Anne Marie Brennan teaches forensic biology at London's South Bank University and is fascinated by these innovations. "Everybody has to love the elephant clock," Brennan said. "The elephant clock is wonderful because it is like a United Nations clock. It has all the elements of different civilizations and I like it as a scientist because it shows that science doesn't have to be boring and sterile and plain, but it can be decorative and it can also pay homage to the cultures that bring it forward." And then there is mathematics and algebra. In general, our numbers are known as "Arabic numerals" today, but it wasn't always so, says professor Hassani. "The numbers that we have today - 1,2,3,4 - they're called Arabic numerals, but actually the Arabs at the time called them Indian numerals," al-Hassani said. And, the number "0" for example - "zephir" in Arabic - was used first by early Arab scholars as an integral part of mathematical equations. And that's part of the all important formula of zeros and ones that was crucial to the development of computers and other new technology. See also the earlier post here.